If you do work in the medical field – whether for a hospital or otherwise – you know just how important invoices are when it comes to getting paid. 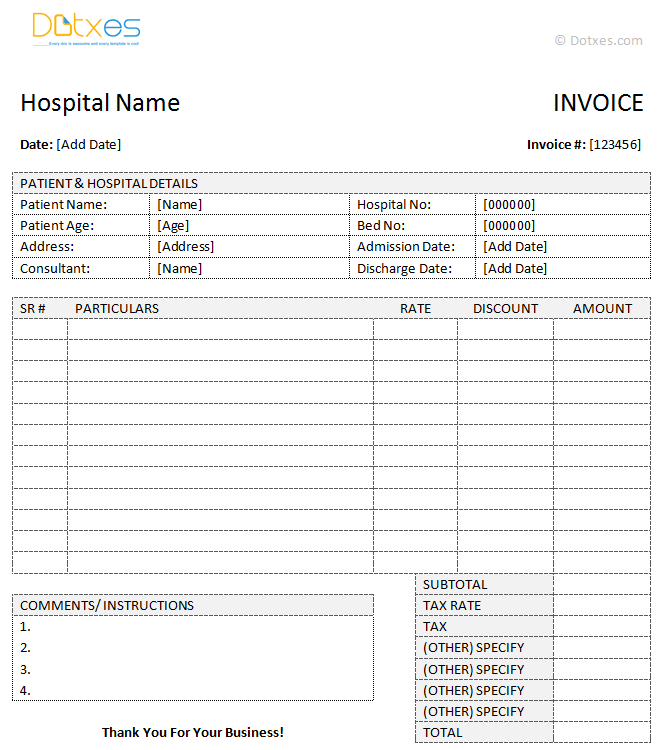 This medical invoice template that was created for Microsoft Word can help you create invoices that are professional in appearance and easy to work with. This medical invoice template includes space for the name of the patient who was treated, as well as their age, address, and bed number. The template also includes space for the admission and discharge dates for the patient. The top of the template has space for the name of the hospital that treated the patient, and the date that the invoice was created. The template includes space for a description of the charges that are being made, any discounts that are applicable, and a total amount due. Consider outlining the payment options that are available directly on the invoice. Know your tax laws, especially in regard to the medical field. Follow up on unpaid invoices on a regular basis. Always double check the information on the invoice before sending it out to make sure that you didn’t mess up when creating it. I likes the complete format, all the necessary details mentioned in the template. Thank You Very much for help.